Abstract. The likelihood of a large volcanic eruption in the future provides the largest uncertainty concerning the evolution of the climate system on the timescale of a few years, but also an excellent opportunity to learn about the behavior of the climate system, and our models thereof. So the following question emerges: how predictable is the response of the climate system to future eruptions? By this we mean to what extent will the volcanic perturbation affect decadal climate predictions and how does the pre-eruption climate state influence the impact of the volcanic signal on the predictions? 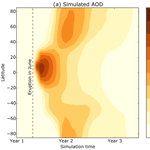 To address these questions, we performed decadal forecasts with the MiKlip prediction system, which is based on the MPI-ESM, in the low-resolution configuration for the initialization years 2012 and 2014, which differ in the Pacific Decadal Oscillation (PDO) and North Atlantic Oscillation (NAO) phase. Each forecast contains an artificial Pinatubo-like eruption starting in June of the first prediction year and consists of 10 ensemble members. For the construction of the aerosol radiative forcing, we used the global aerosol model ECHAM5-HAM in a version adapted for volcanic eruptions. We investigate the response of different climate variables, including near-surface air temperature, precipitation, frost days, and sea ice area fraction. Our results show that the average global cooling response over 4 years of about 0.2K and the precipitation decrease of about 0.025mm day−1 is relatively robust throughout the different experiments and seemingly independent of the initialization state. However, on a regional scale, we find substantial differences between the initializations. The cooling effect in the North Atlantic and Europe lasts longer and the Arctic sea ice increase is stronger in the simulations initialized in 2014. In contrast, the forecast initialized in 2012 with a negative PDO shows a prolonged cooling in the North Pacific basin. How to cite: Illing, S., Kadow, C., Pohlmann, H., and Timmreck, C.: Assessing the impact of a future volcanic eruption on decadal predictions, Earth Syst. Dynam., 9, 701-715, https://doi.org/10.5194/esd-9-701-2018, 2018.